Aiming to have the perfect marriage is my mission; it’s my quest; it’s my Mount Everest. Please note: Digital files (such as audiobooks) will be sent to you in a zipped format and thus cannot be accessed by a mobile device until unzipped. Eric and Leslie believe that a thriving marriage—not just a surviving one—should be the aim of every couple. Every couple has a choice of how they are going to begin their proverbial ride into the sunset. 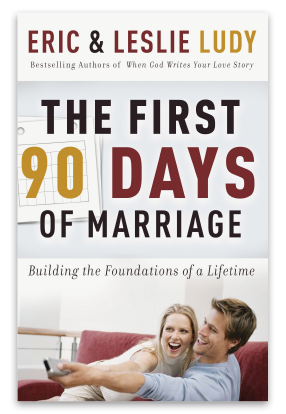 If you proactively maximize your first 90 days of marriage, you will avoid years of heartache, disillusionment, and having to “un-learn” all the wrong habits that were set in those early months. Marriage is serious business. It’s intense, it’s challenging, it’s important work. However, this book will display that marriage is also romantic, fun, and full of magical wonder. Marriage will likely be one of the hardest things you will ever do. But marriage should also be one of the most enjoyable things you ever do. “How to Tackle Life as a Team"
The First 90 Days of Marriage will help couples lay the foundation for a God-scripted, happily-ever-after relationship that only gets better with time. Whether you are soon to be married, have been married many years, or simply want to gain God’s perspective for marriage in your single years, you’ll greatly benefit from this book.